the craft beer industry is a community of incredible, creative, loving people who truly want to make the world a better place, one pint at a time. Nothing more clearly demonstrates that commitment to community (both within the industry and the community at large) than the event last Sunday: A Night to Remember beer festival. Alex Teves was a regular – and beer club member #28 (that’s a number sign, for all those of you born after 1990) – at Copper Kettle Brewing Company in Denver on the border with Aurora. From all accounts he was a true beer geek (his photo, which remains in the mug case at the brewery, is of him stoically hoisting his mug in salute) and all-around warm, funny guy. From all of the stories we heard of him this weekend, he sounded like exactly the kind of guy we like to strike up a lively conversation with when we visit breweries. Who knows, on one of our many visits to Copper Kettle, we might have. He lost his life at the age of 24 while watching the Dark Knight Rises with his girlfriend and a friend on July 20, 2012. In honor of their patron and friend, Copper Kettle put together a gathering to memorialize Alex at their brewery, inviting others to join in on the remembrance and giving the proceeds away to charity. Since that initial event, the fest has grown significantly, moved out of the Copper Kettle parking lot, and to the beautiful Four Mile Historic Park. This year was the 4th annual A Night to Remember, celebrating the life of Alex and the other victims of July 20, 2012, and bringing people together for beer and laughter and charity and community. The charity is the ACT Foundation, founded in Alex’s name to provide funding and scholarships for Humanex Academy. While I had wanted to go to this event since first hearing about it in 2012 (more on that in a minute), finding out that it was a fundraiser for Humanex, where the Beerded Brewer himself attended high school, meant that, this year, we would scrape together our meager funds and make it happen. What happened on July 2oth hit me deeply (as it did many others). While I can never fully understand what the people who were there that night went through, I may understand more than some. I was a student at Columbine High School in 1999 when we experienced our own shooting. And while what happened in Littleton and what happened in Aurora are very, very different, the way both happened in “safe” spaces, the way both became media spectacles, the way both killed people who had not yet had a chance to really live, the way the area became so much more than a town or a neighborhood… but a true community, were very much the same. The differences are many… maybe it was because what happened at Columbine was so huge compared to what came before. Maybe it was because it lasted for so long. Maybe it was because it unfolded on TV in front of the world in a way no other incident of its kind ever had. Maybe it was because the perpetrators took their lives before we could ask why. Why? But, afterwards, there was so much anger. So much hatred and vitriol and grief without an outlet, that cracks formed in that community. Cracks that some of us slipped right out of and have only been able to tenuously hold our grip onto. That is the opposite of what I saw on Sunday. Three years on, I saw a celebration of life and living and togetherness that I never felt after Columbine. It was not the kind of grief-laden, obligatory gathering that follows a tragedy where people want to say so much and can’t figure out what to say because there simply aren’t words. It isn’t the false comfort of strangers who come from afar with good intentions and bad assumptions. It also wasn’t a beer fest full of rowdy revelers drinking to distraction and drunkenness. We all knew why we were there. We felt it. Breweries wrapping around Four Mile Historic Park. And there were some great beers there. I can’t go without mentioning them because this is, allegedly, a beer blog. The most pleasant surprise of the night were the beers from WeldWerks out of Greeley. All four of their beers were clean and very tasty. I particularly enjoyed their coffee brown which retained it’s beer profile which still being very coffee-forward. Even their hefe – most definitely not a style I go for – was well-rounded with just the right amount of isoamyl acetate (banana esters). Ratio Beerworks brought their strawberry Berliner weiss which was a great refresher for the oppressively muggy night. You could tell that they used real strawberries (side note: please stop using extracts, breweries, they are icky) and it provided just the right amount of tart and sweet. It was one of the few beers I went back for seconds (and thirds… and fourths…) for. Locavore Beer Works showed up with their exemplary double IPA: Lightnin’ Hopkiss. I was sorely disappointed to hear that they had not entered this beer into GABF, because it is one of the most finely balanced double IPAs I have ever had. A high tropical note is balanced by a little malt sweetness (but not at all sticky or cloying) and just a little dankness to finish it off. Grimm Brothers’ maibock was also a pleasant surprise. For a couple of years, maibocks were the “hot thing” in craft brewing. Seeing as it is one of my favorite styles, this way great. But, like so many fads (I’m looking at you, gose), they tend to fade back into obsurity, leaving us all a little thirstier. It was on the malt-heavy side for a maibock, but was in no way sweet. A very nice example of the style and a good reminder of why German lagers are so popular. 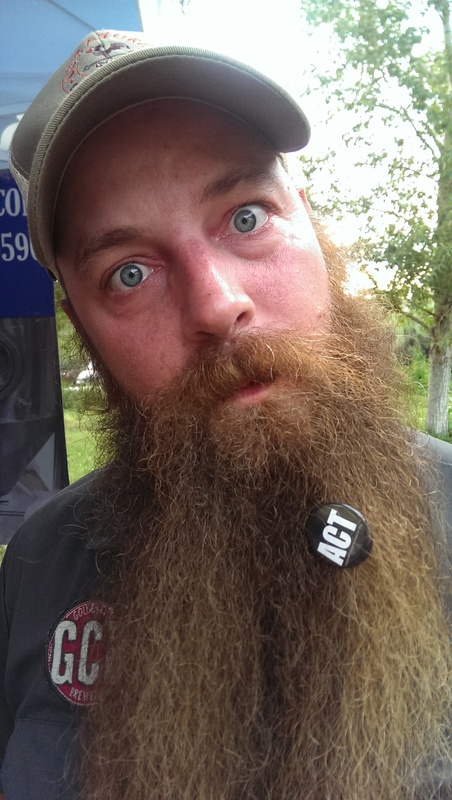 Sporting his ACT Foundation pin in the absolutely most logical place. A Night to Remember was a lot of fun. 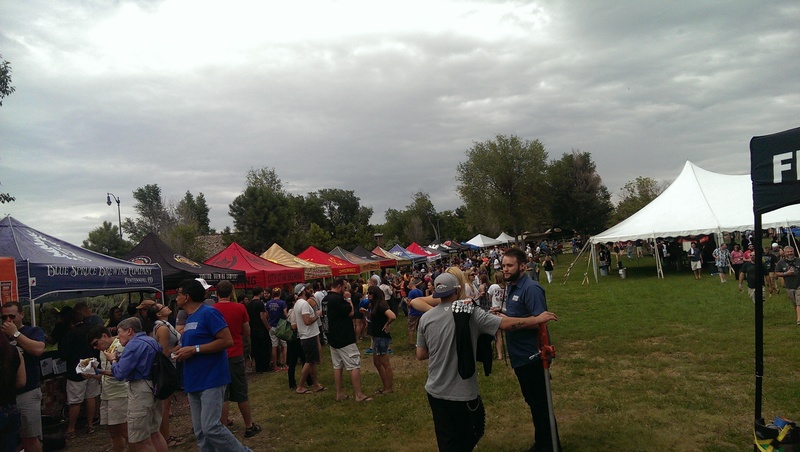 So many excellent breweries and food trucks attended and I enjoyed talking to old friends and making some new ones. But it was also emotional. The Beerded Brewer and I were honored to meet Alex’s parents, Tom and Caren, who are warm, passionate individuals of incredible strength. Tom was cracking us up and making us cry all at once – turning my strawberry Berliner weiss into a strawberry gose. * He told us: “Caren looks forward to this day all year.” And, looking around at all of the people there because of Alex, supporting a cause he believed in, delighting in one of his favorite activities… it felt like a party where Alex was the guest of honor. And he was. Alex was there in the obvious ways: his silhouette on our cups and on shirts, but he was also there in his parents and family and friends who knew him and came to honor him. And he was there in those of us who never had the privilege to meet him, but came anyway. Some may have come only for the beer, but we all left with more. I find myself overwhelmed at times by how incredibly good people can be, and events like this one serve to remind me that, by being a part of the craft beer industry, I have chosen to surround myself with some of the best people in the world. I am so very, very lucky. A beautiful video was made of the 2nd annual event. It made me cry. Because I can’t help it. Special thanks to Doug at Dry Dock for sharing one of their passes with us. Without it, we would not have been able to attend. *I was going to apologize for that joke. But now by the time I finished, I decided that I refuse. Haha! Terrible beer jokes forever!!! Good piece. You are a good writer and have a big heart.